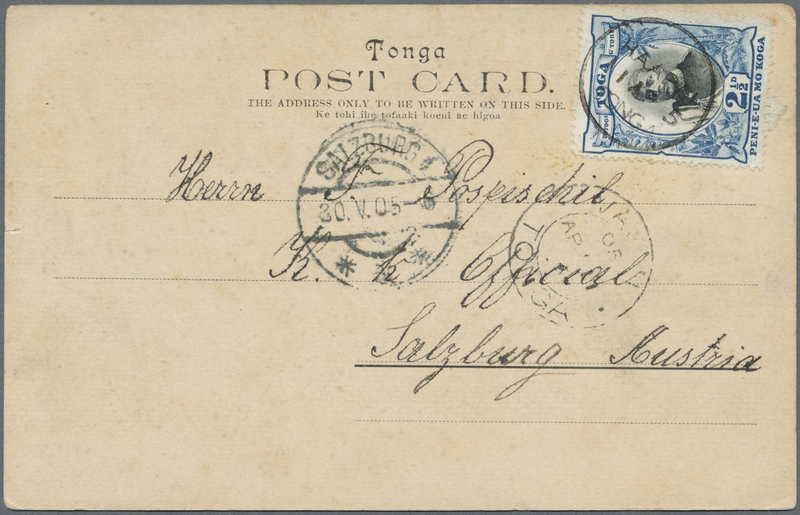 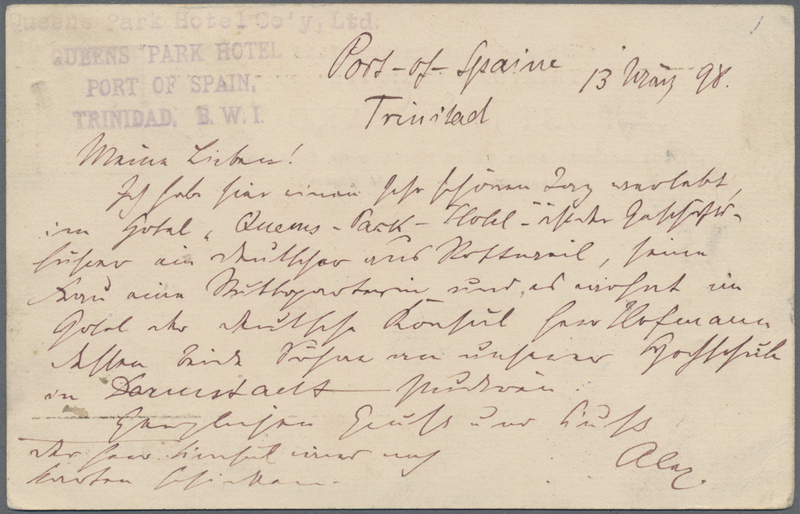 12871 Ansichtskarte (Picture postcard) 1905, 2 1/2 d tied "HAAPAI TONGA 11 AP5" to ppc via "VAINI 05 AP 11" to Austria w. arrival "SALZBURG 30.V.05". 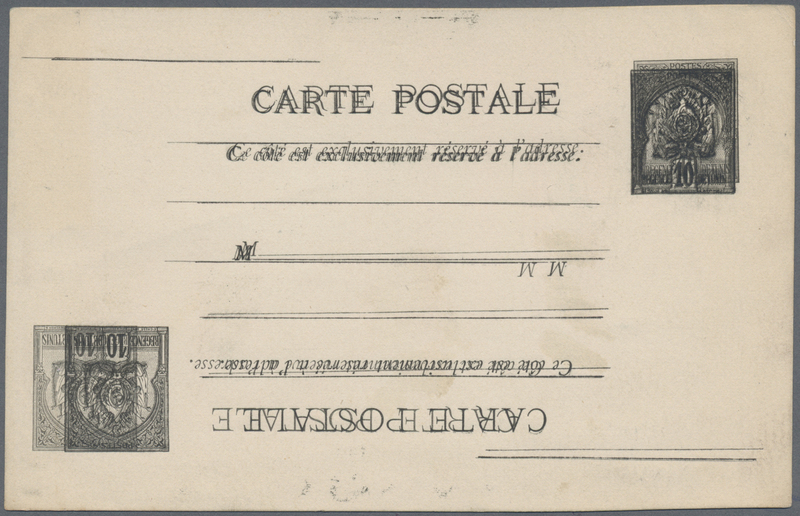 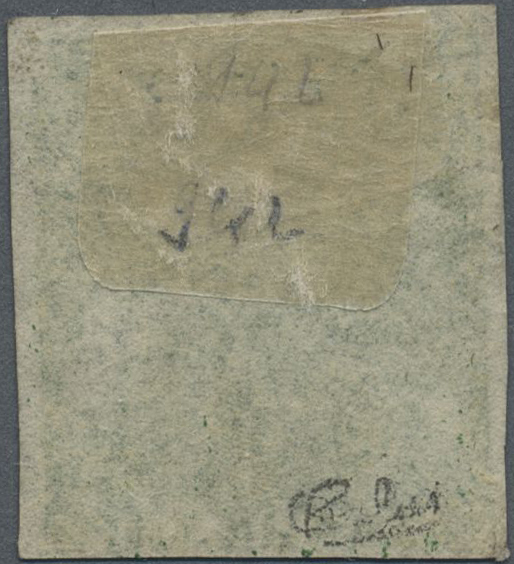 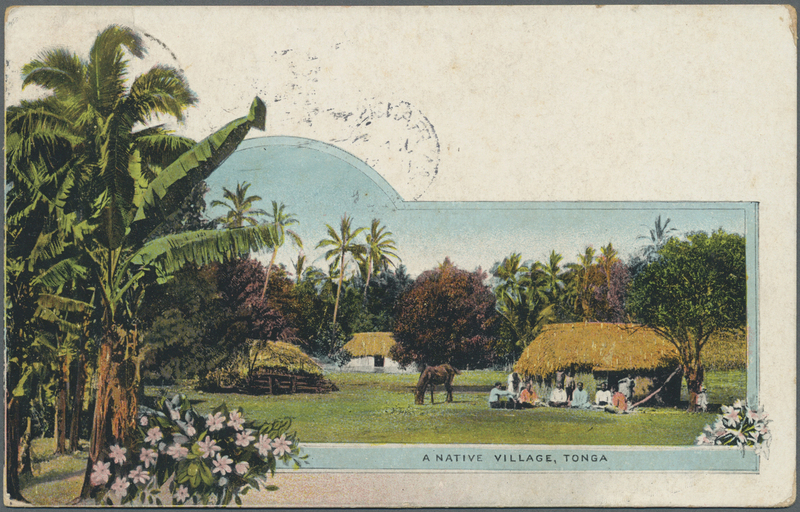 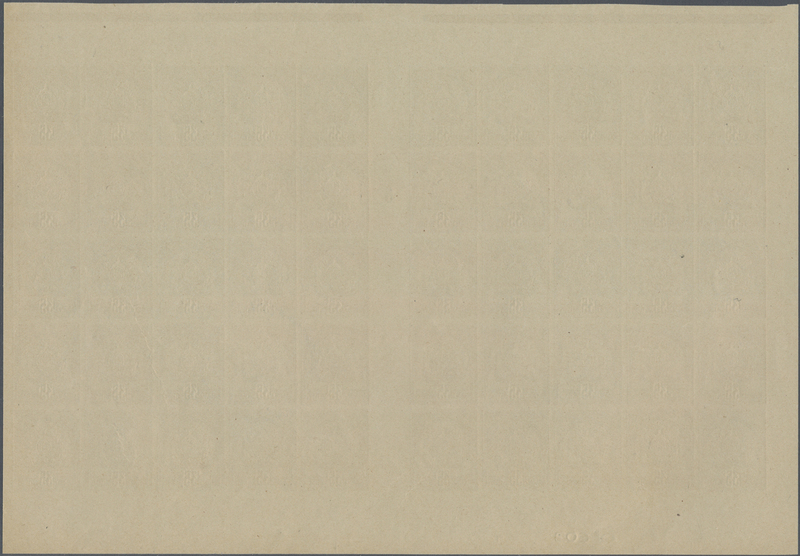 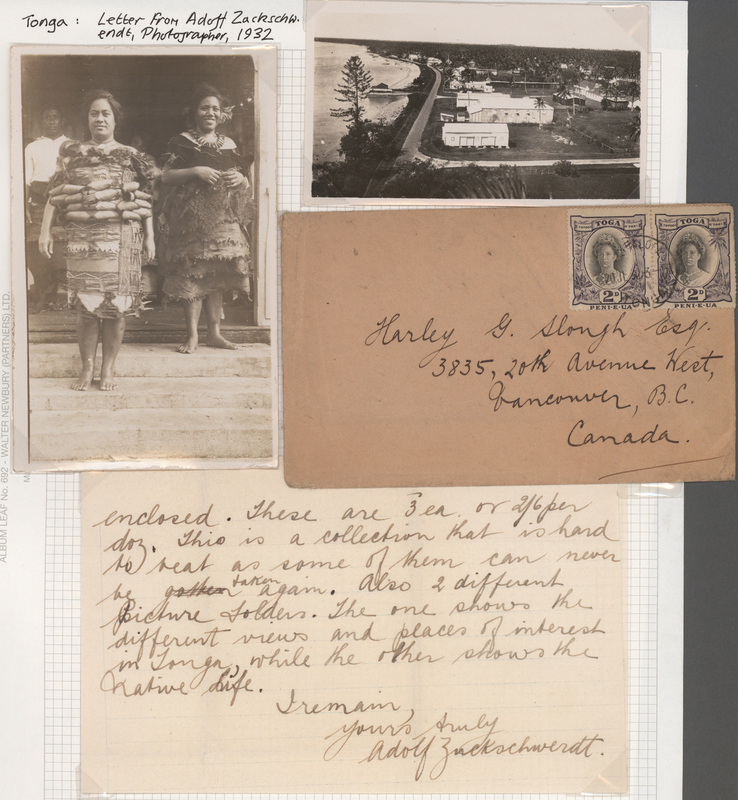 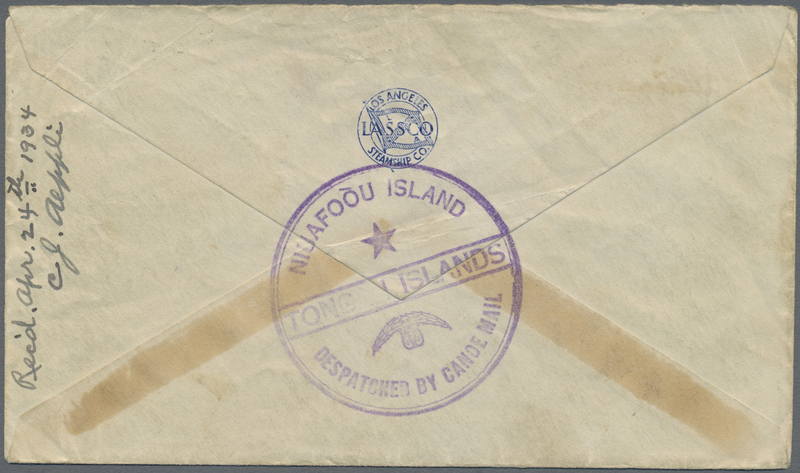 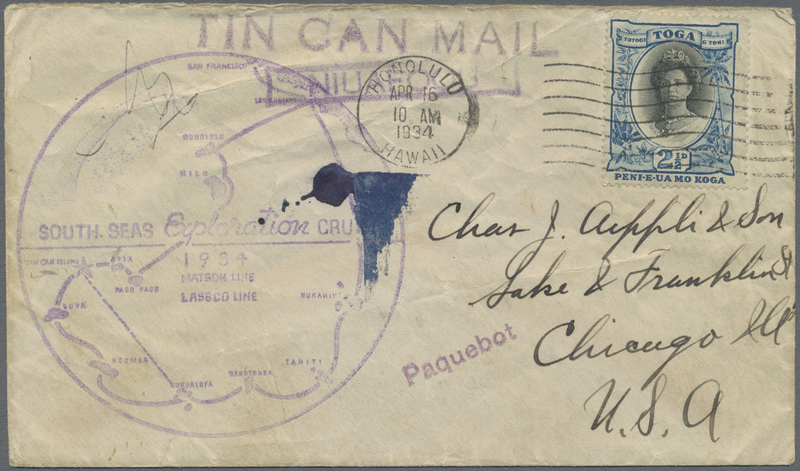 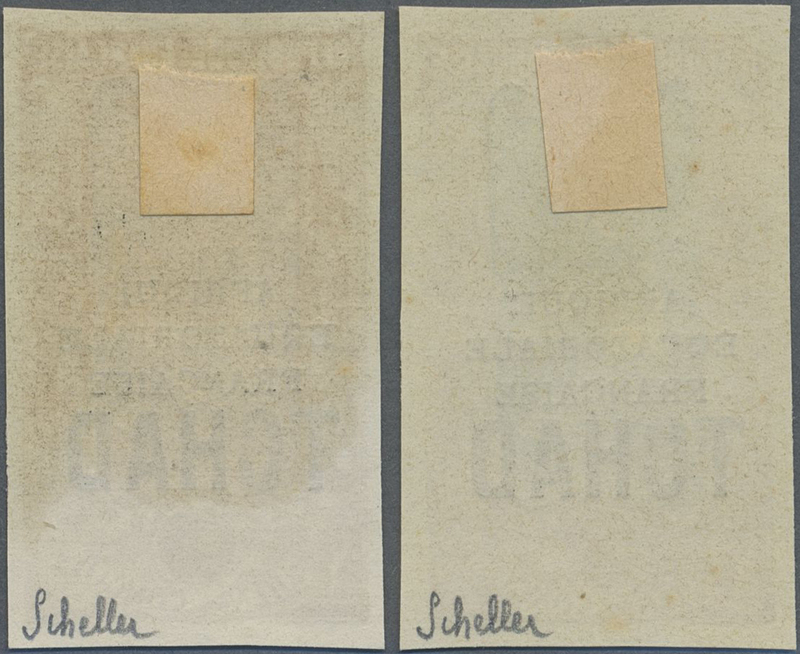 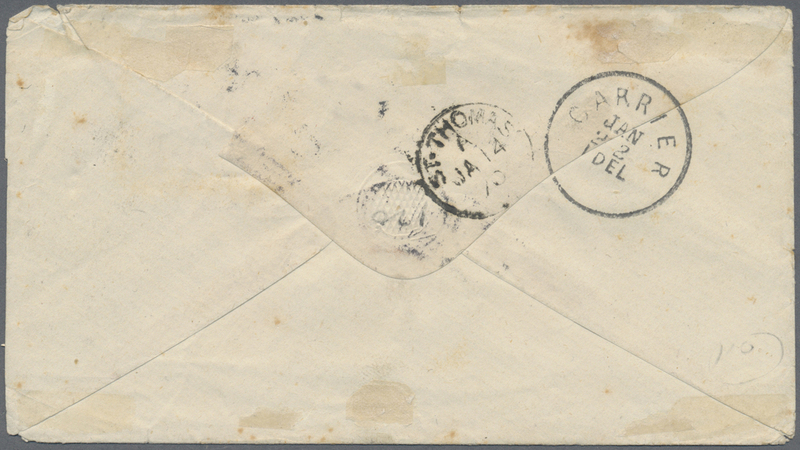 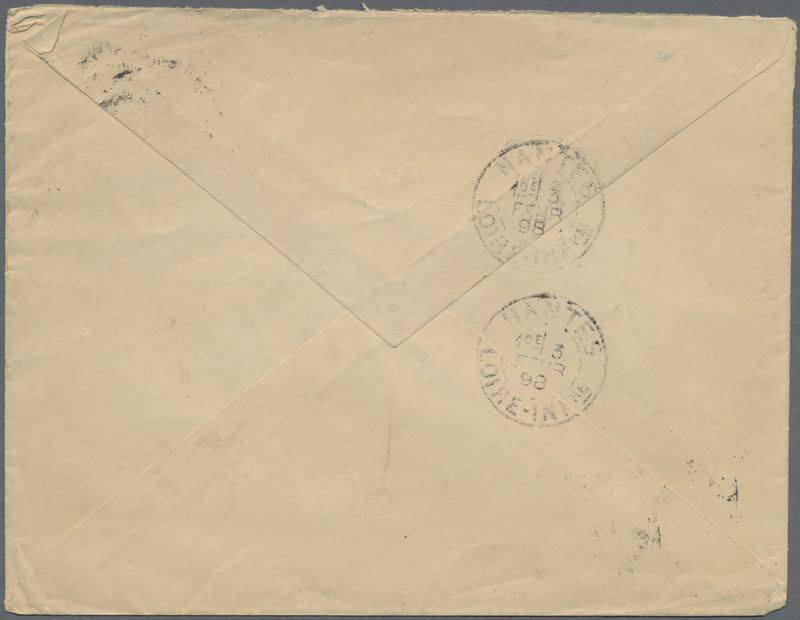 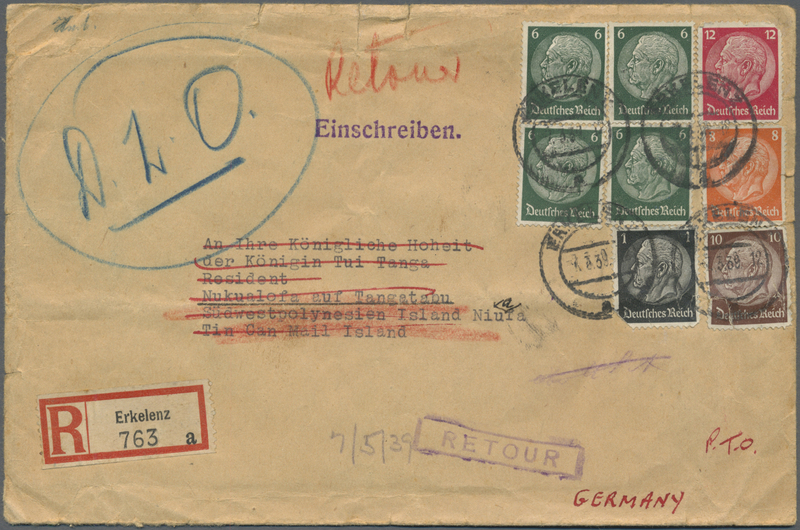 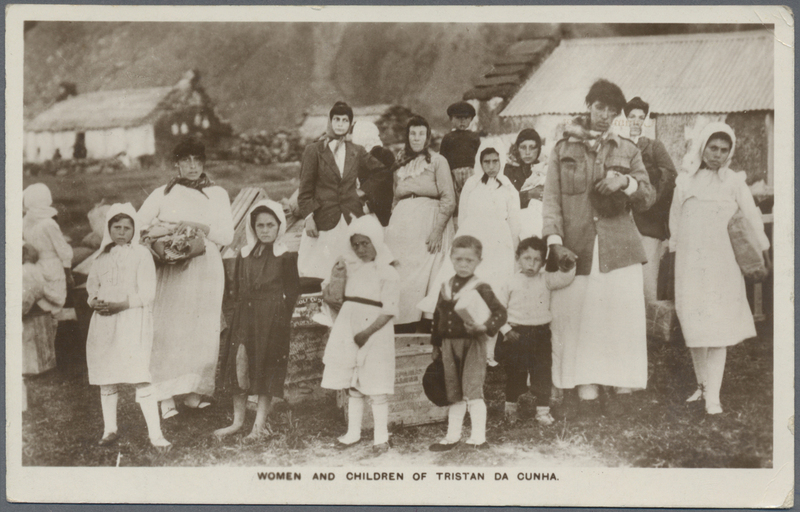 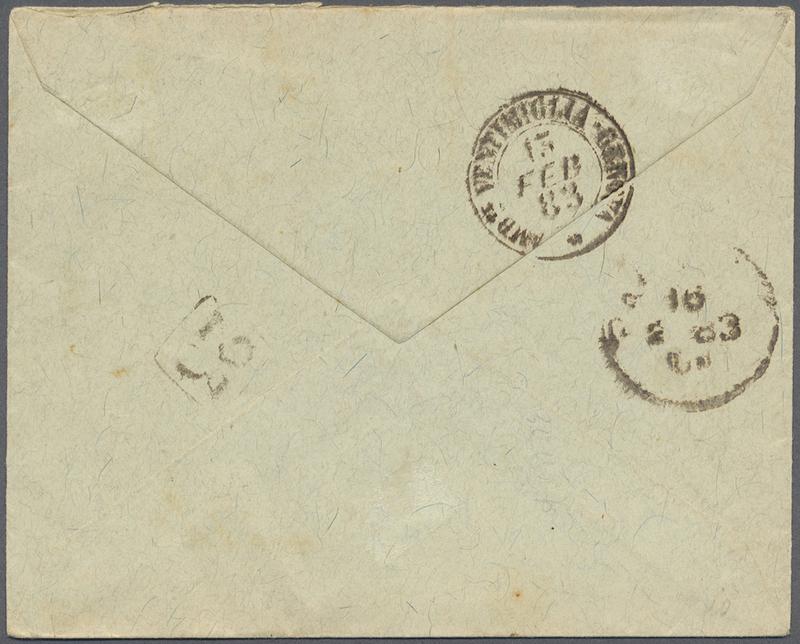 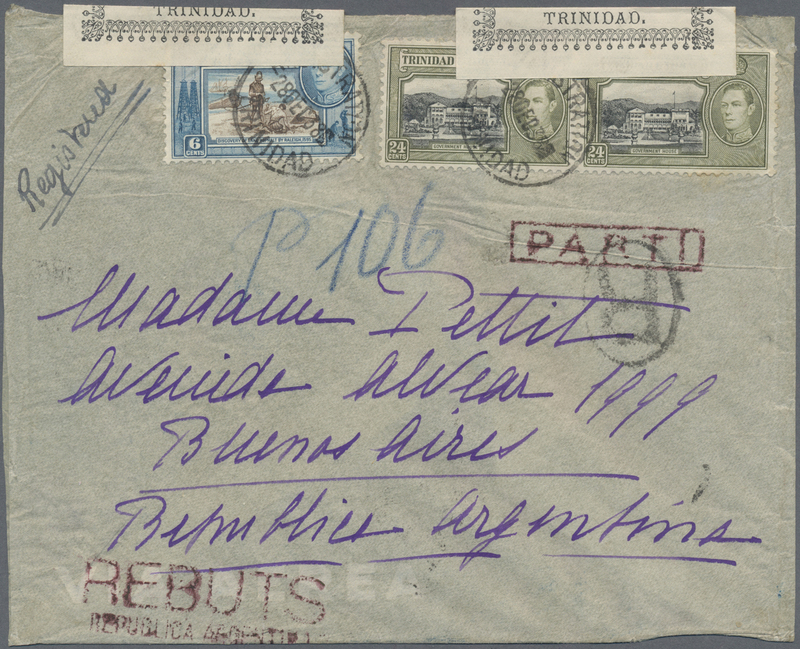 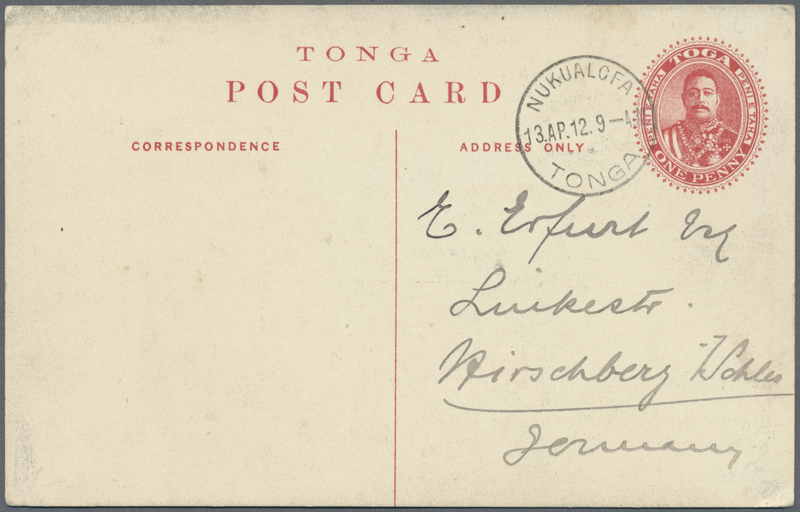 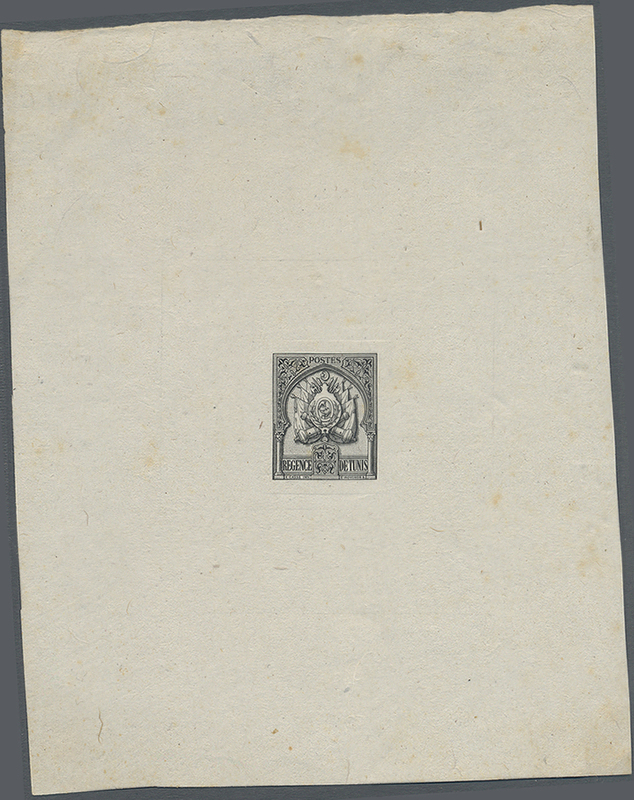 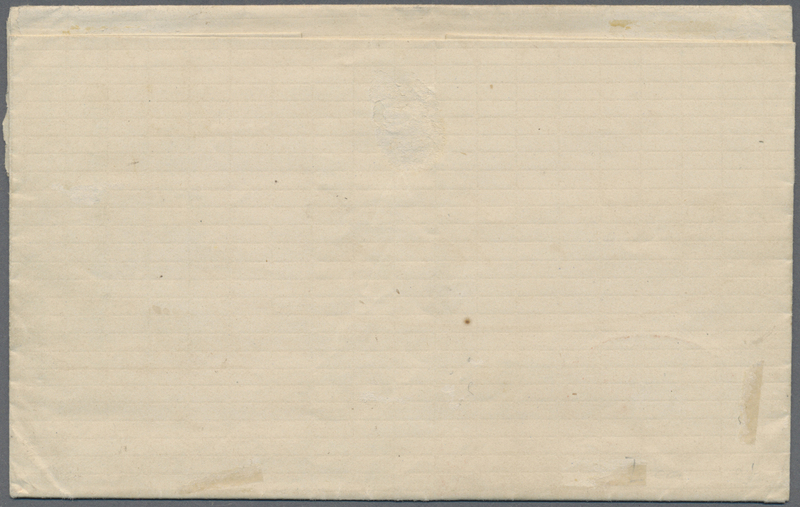 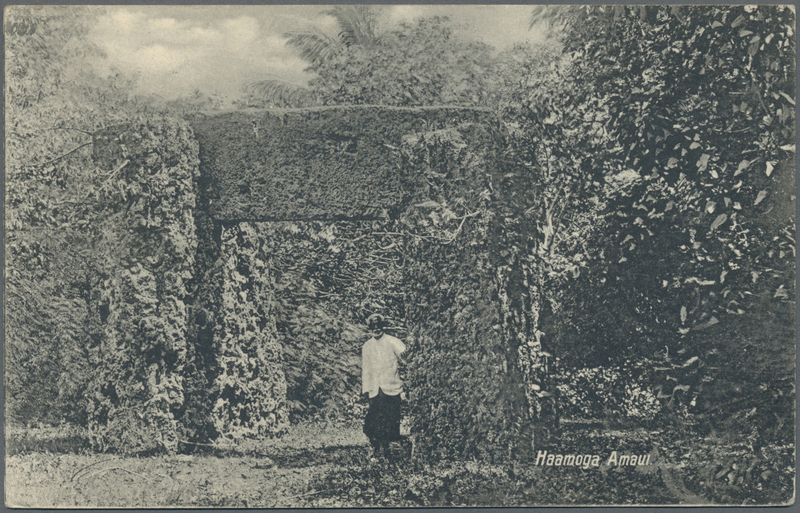 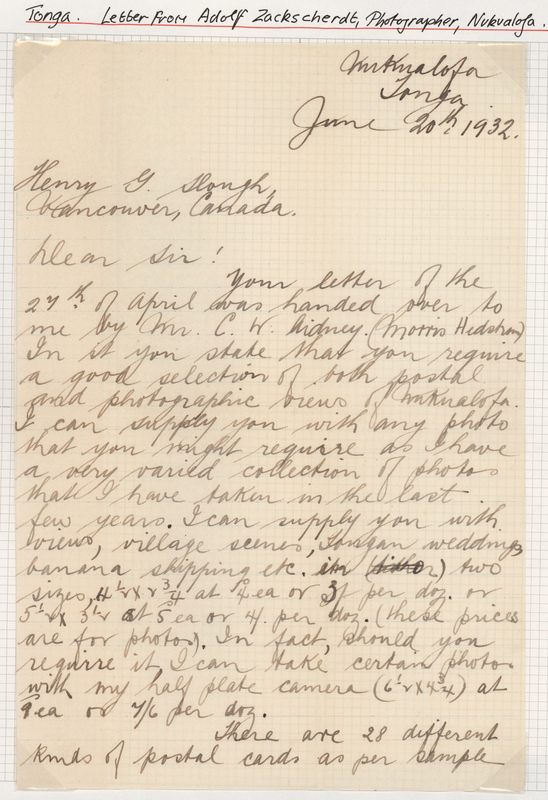 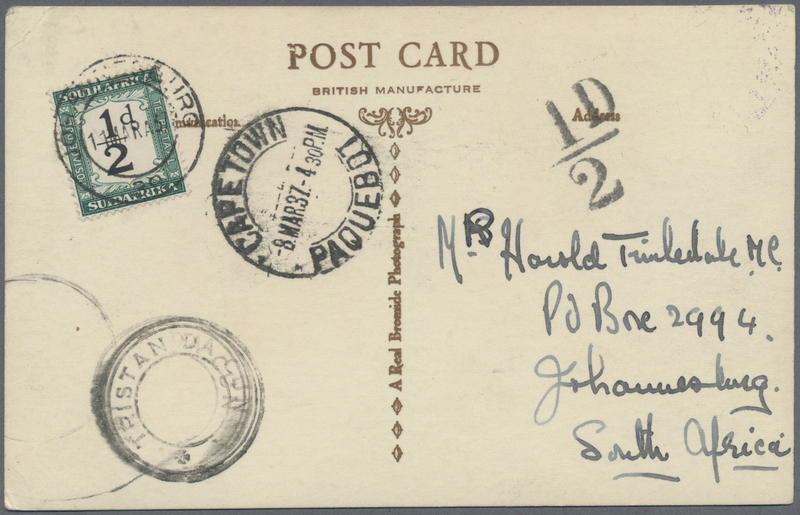 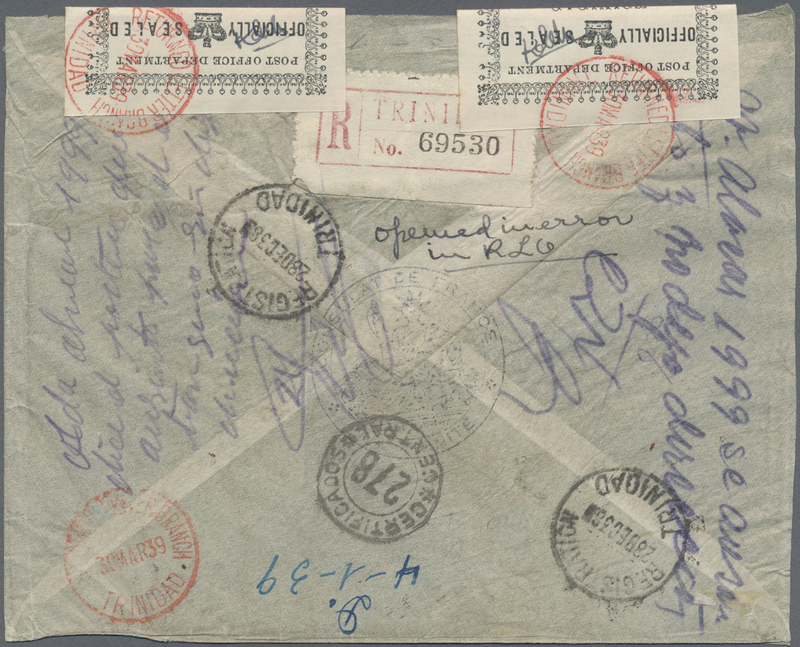 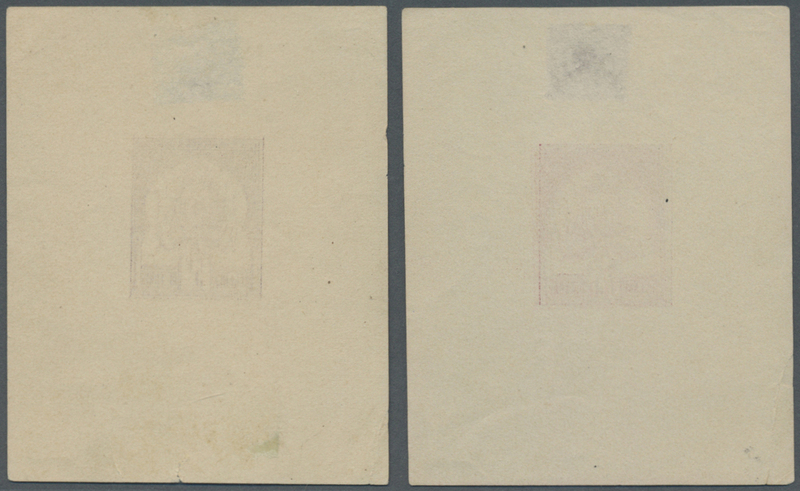 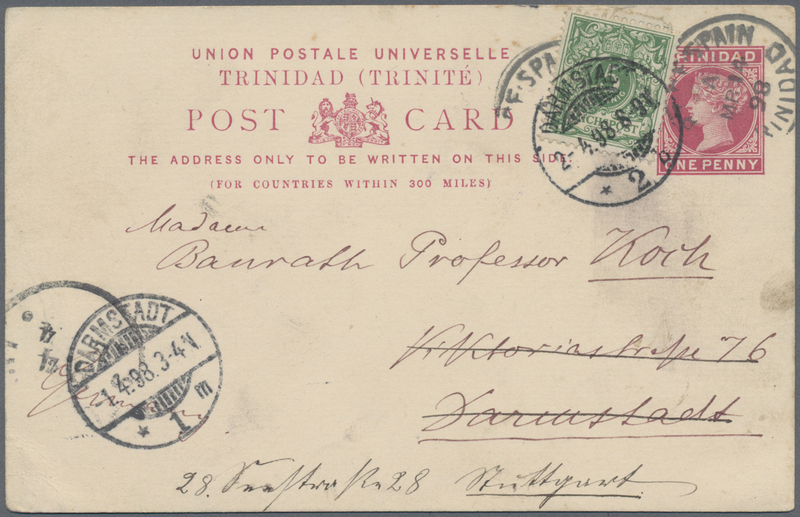 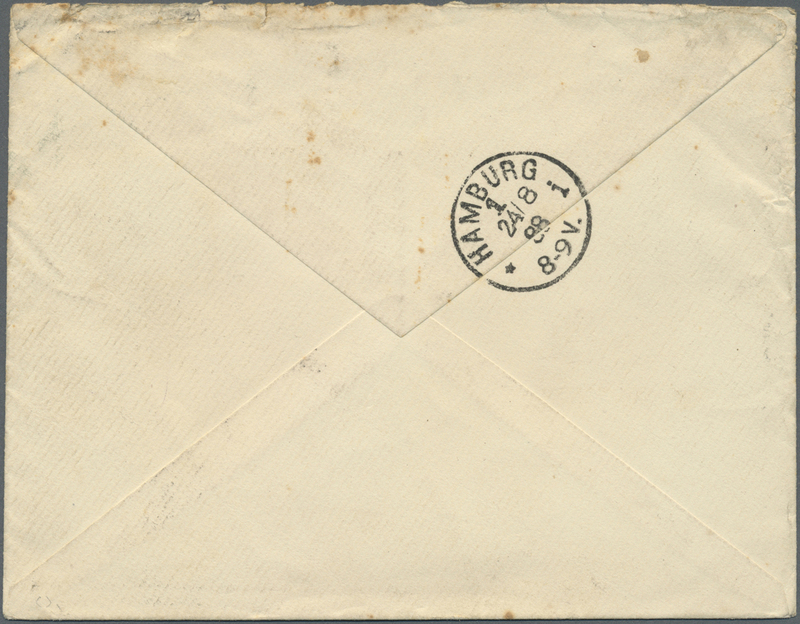 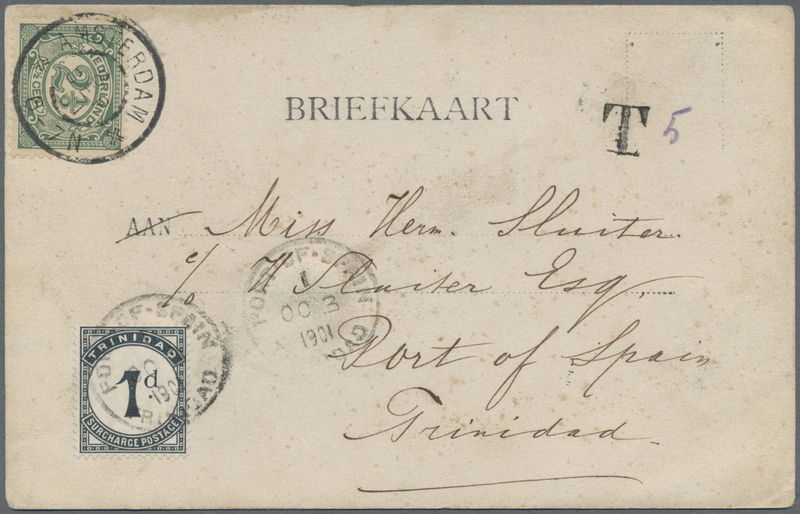 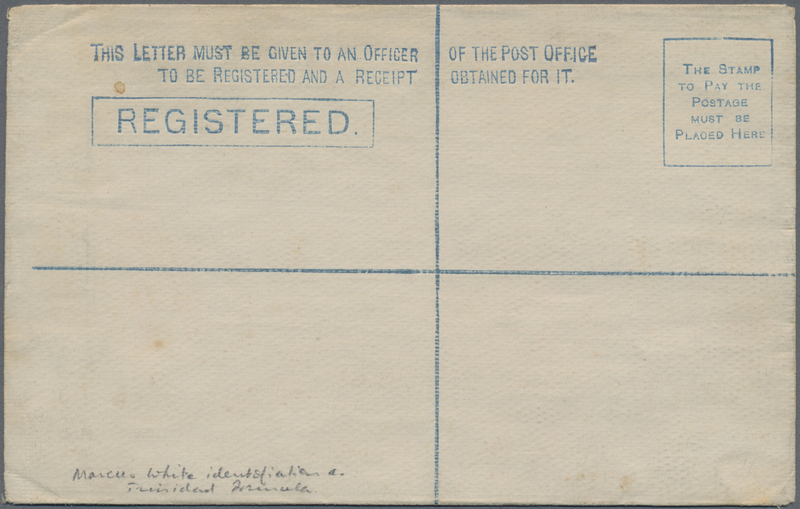 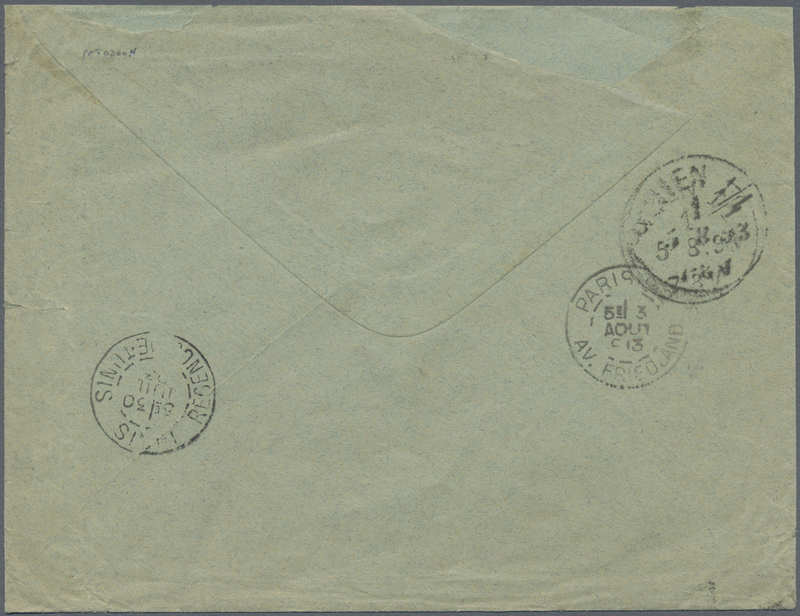 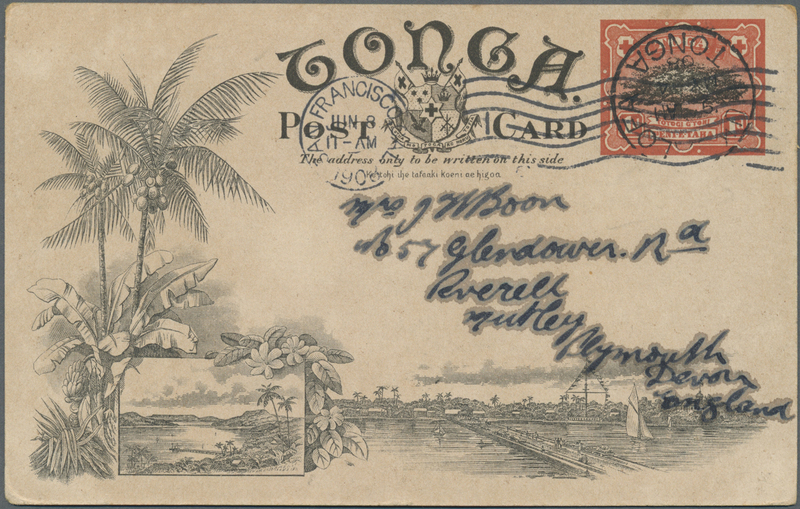 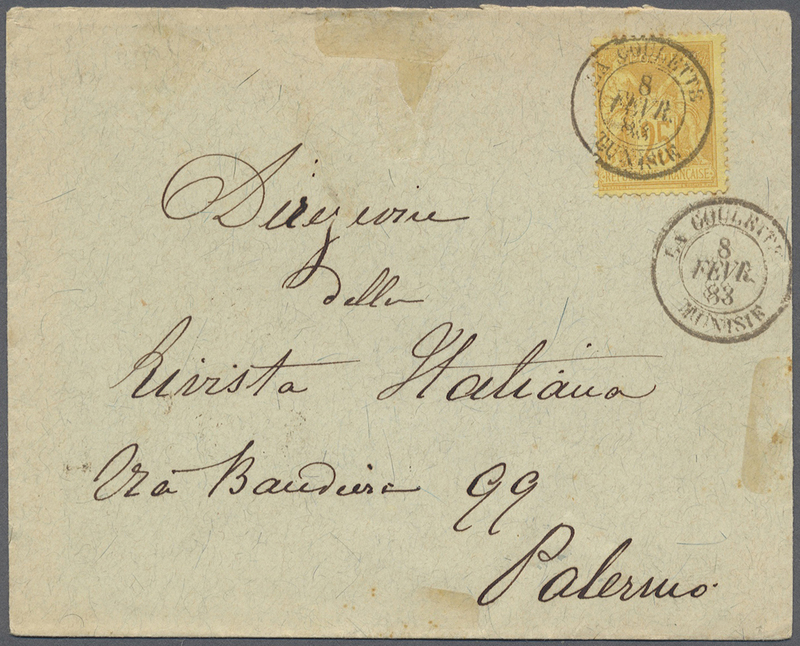 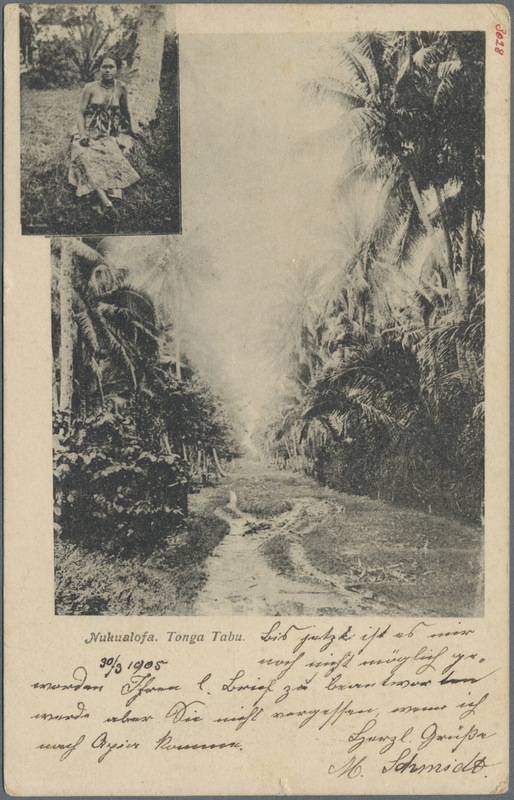 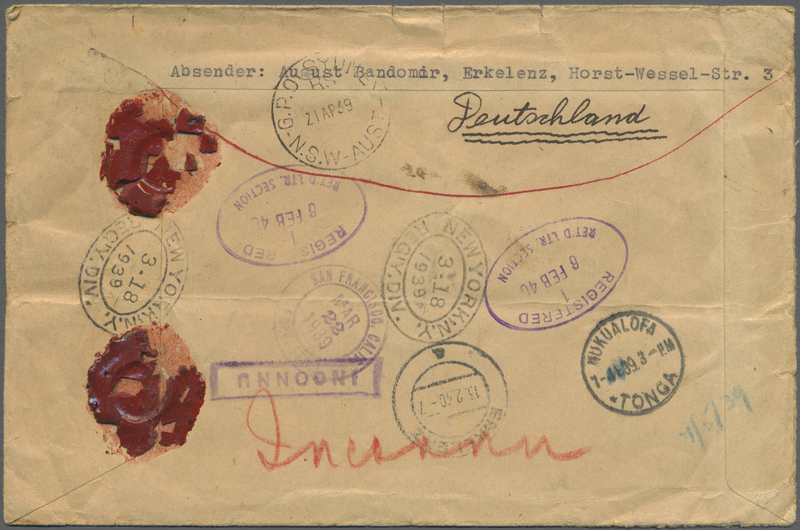 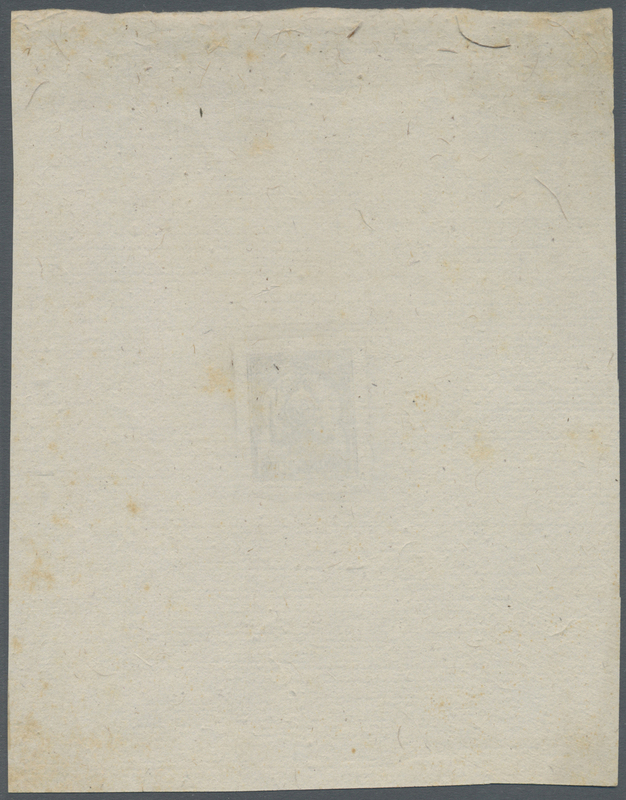 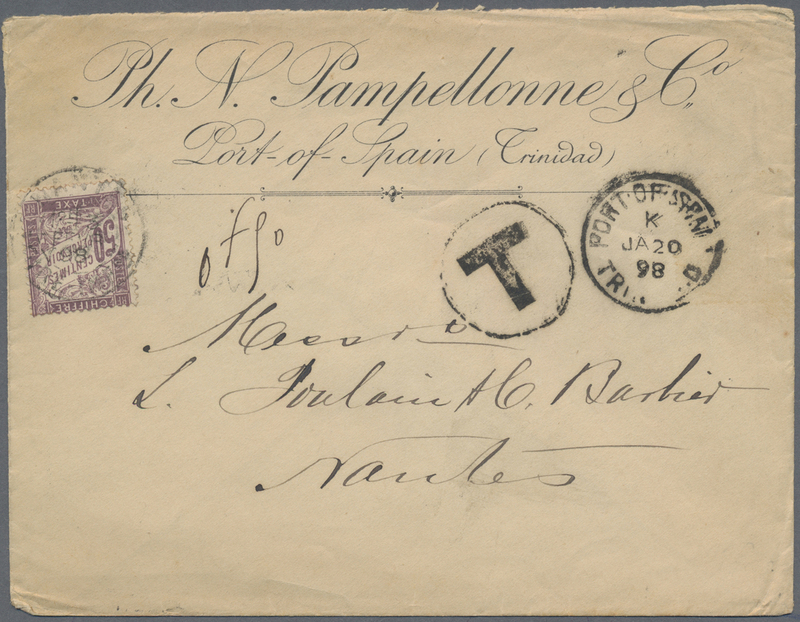 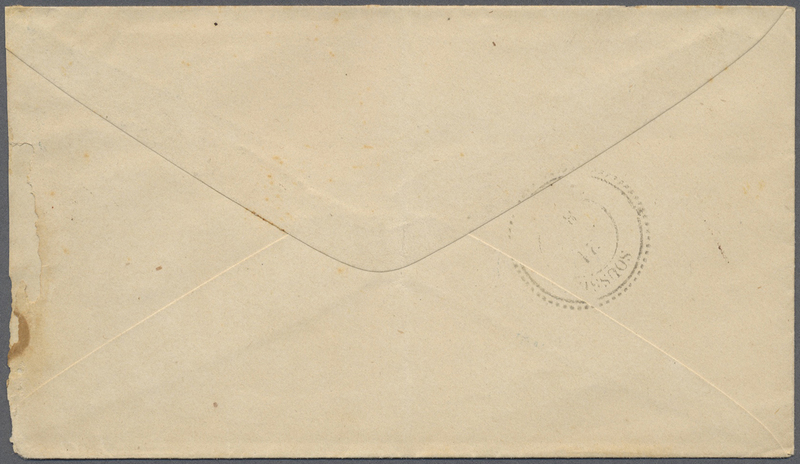 12874 Brief (cover) 1932, 2d (pair) tied "NUKUALOFA 20 Jl 32" to cover to Canada, includes two-page letter and two photographs done by sender, photographer Adolf Zuckschwerdt (1912-35). 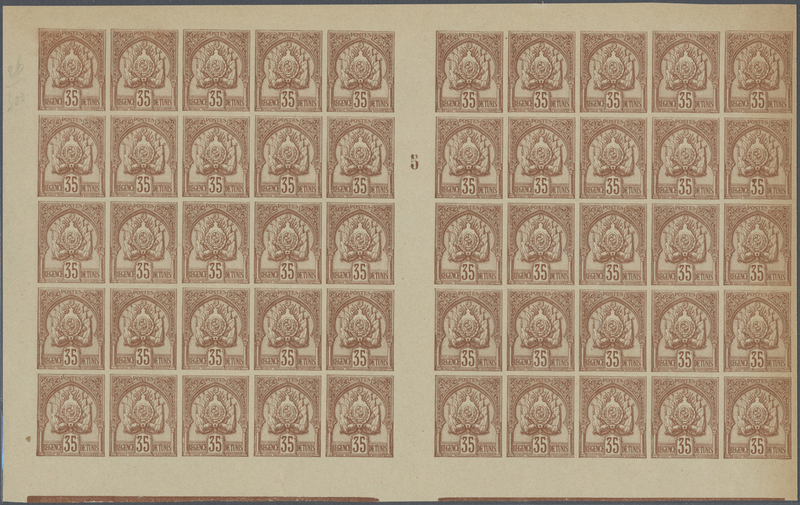 12901 ungebraucht ohne Gummi (unused without gum) (*) 1/8 proof 1888, Coat of Arms with plain background complete set of eight 1c. 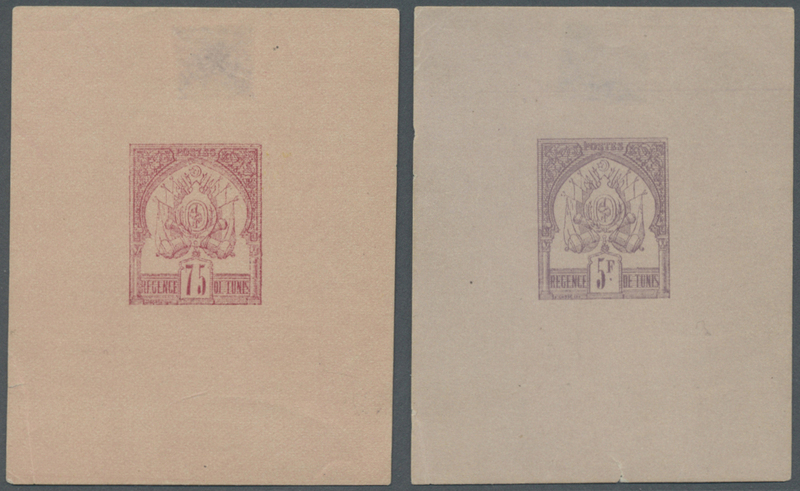 to 5fr. 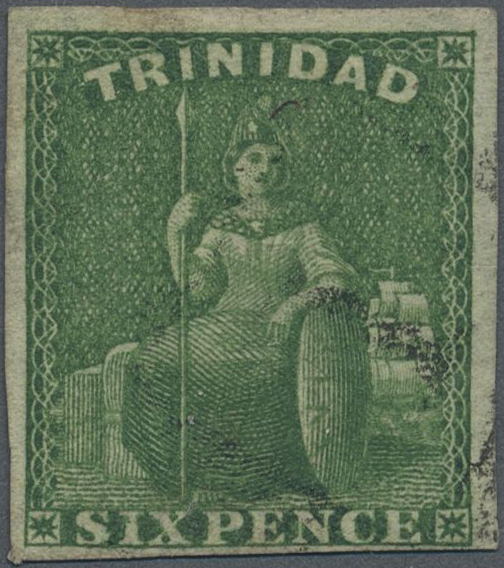 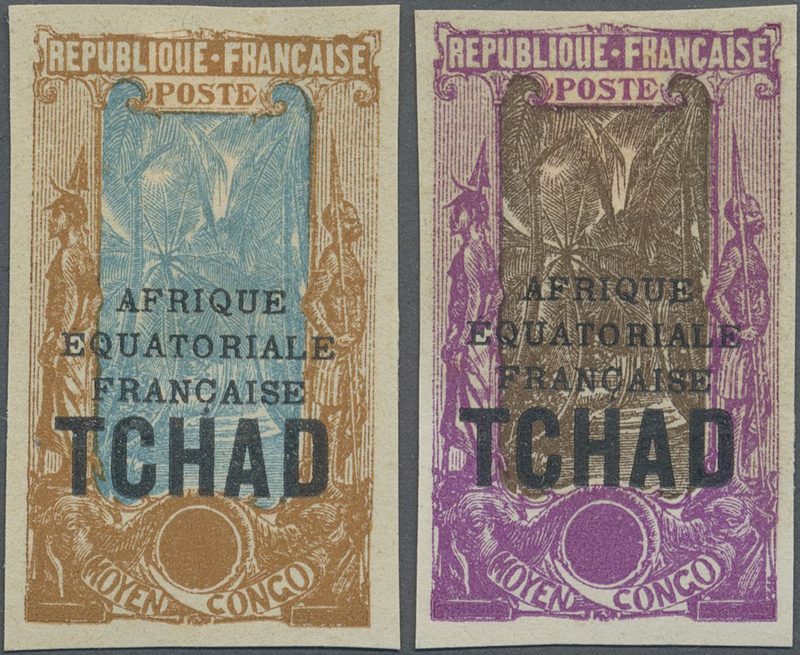 in issued colour on coloured paper in imperforate single PROOFS on thin ungummed paper, thinned from hinges at top margins, very scarce set! 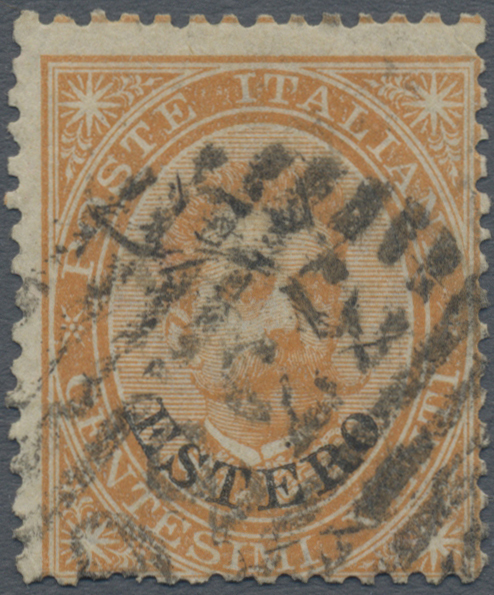 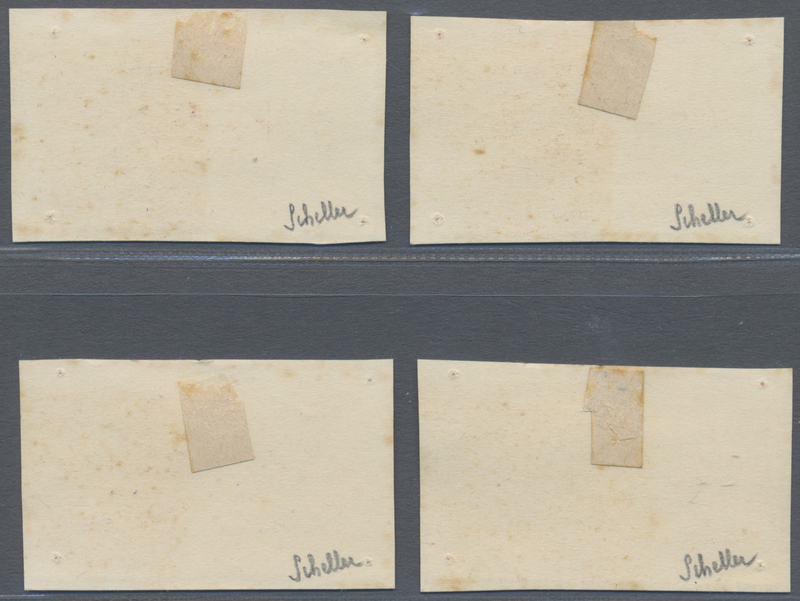 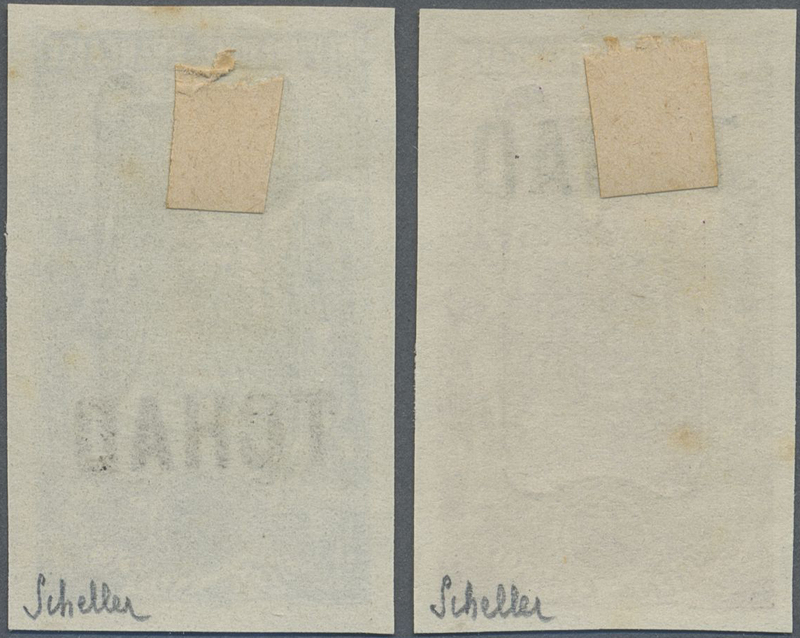 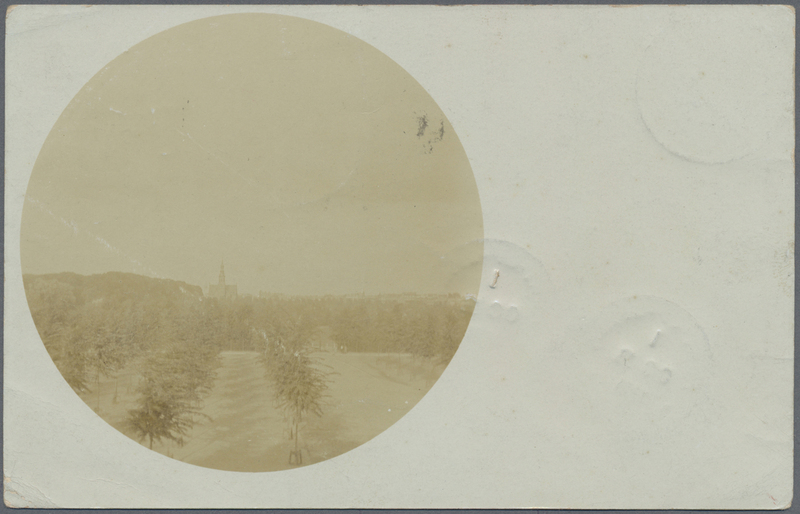 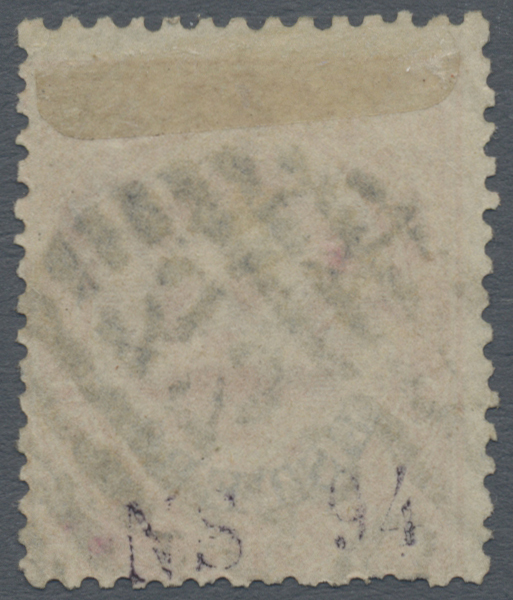 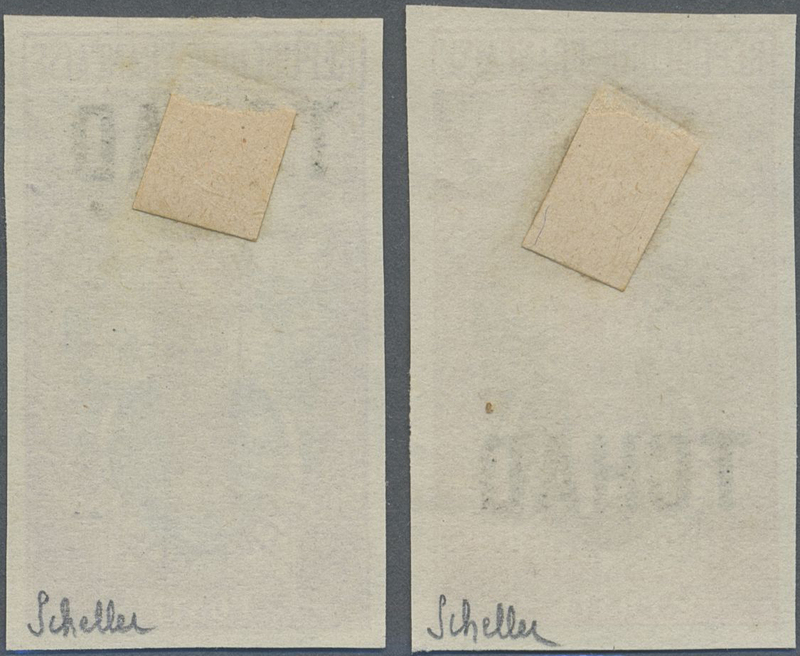 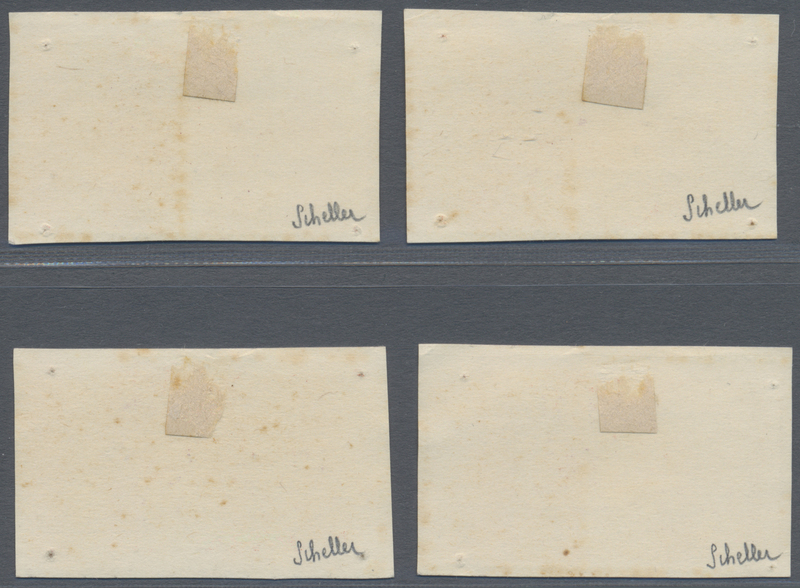 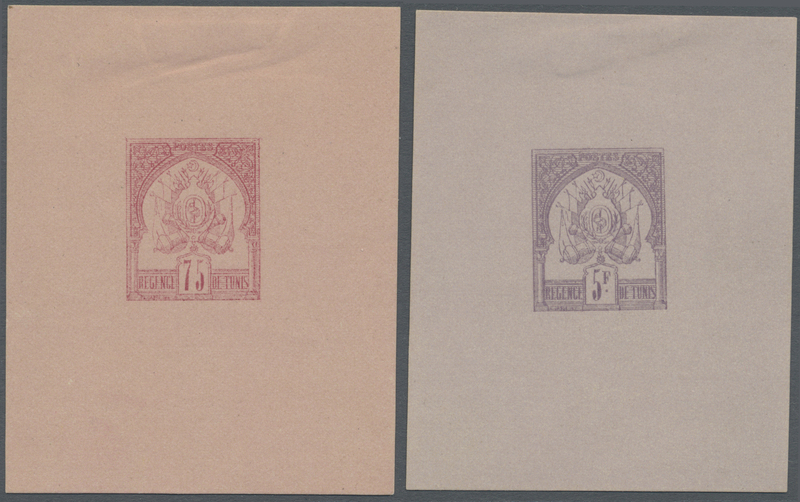 12902 ungebraucht ohne Gummi (unused without gum) (*) refers to 1/8 1888, Coat of Arms 1c. 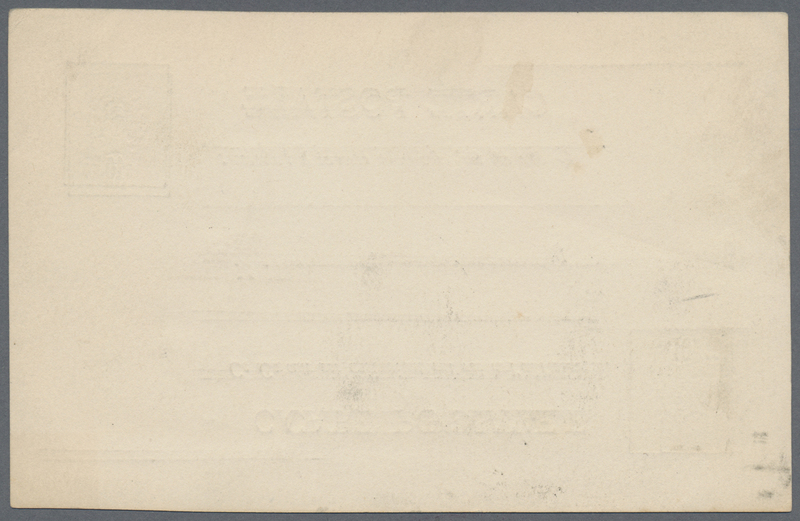 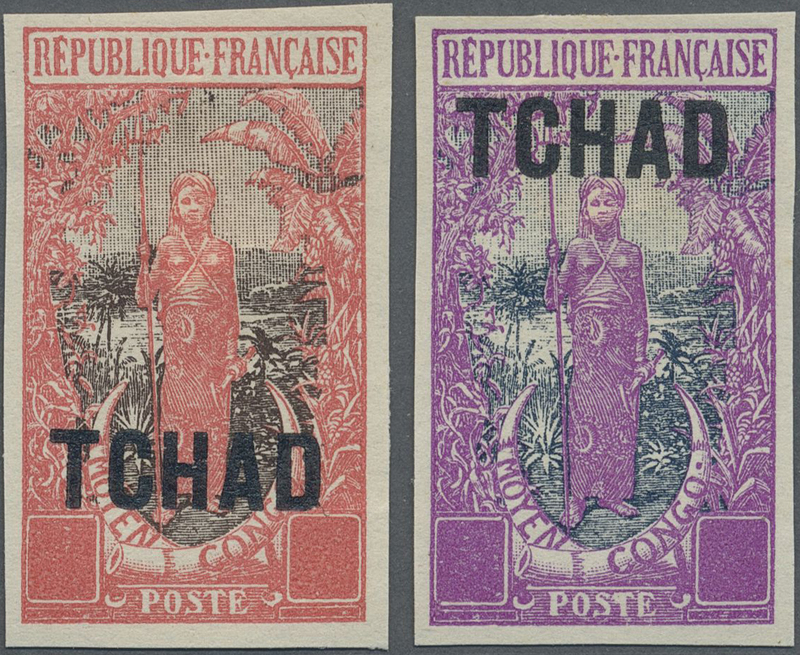 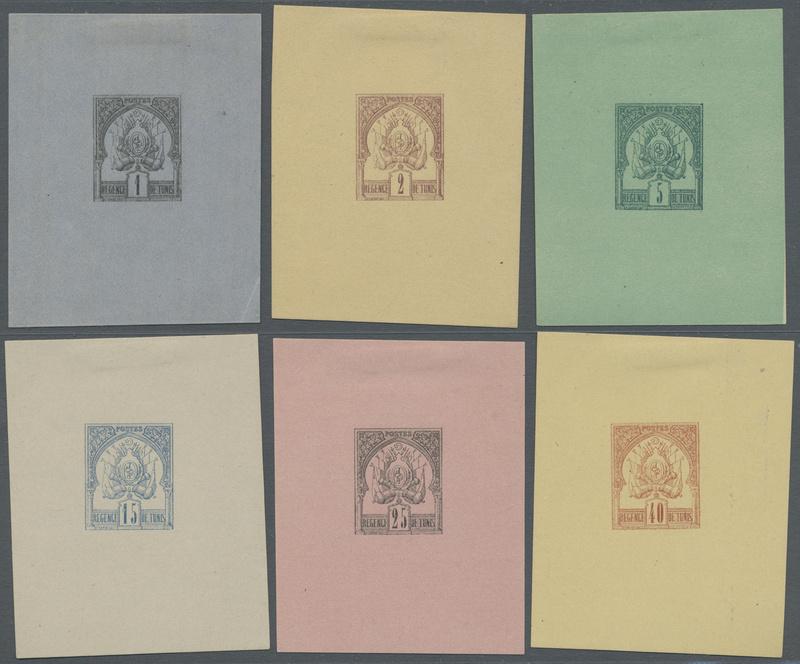 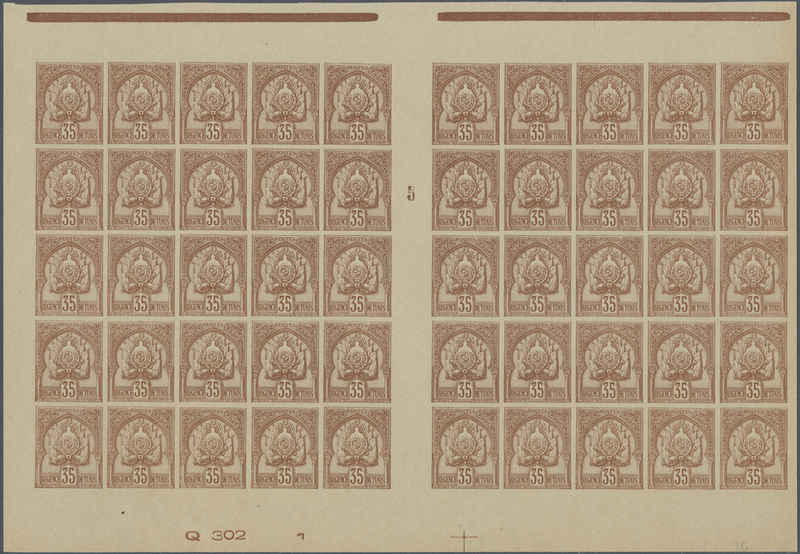 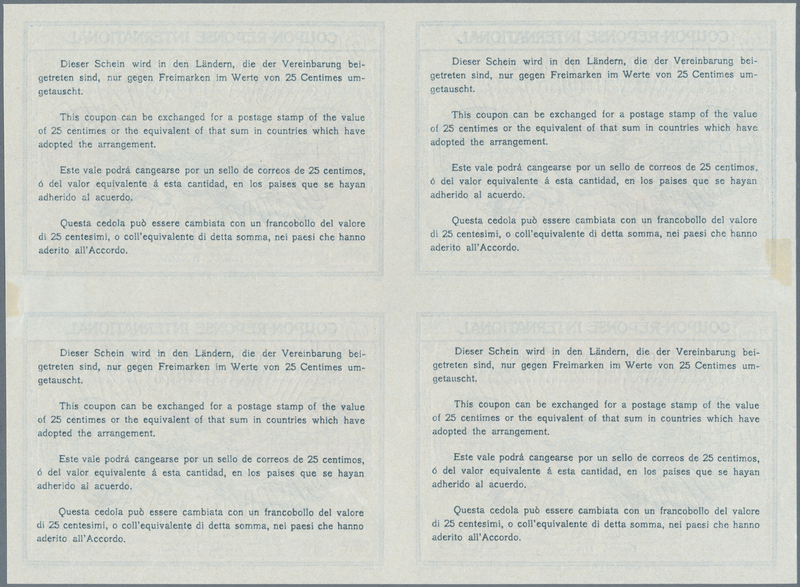 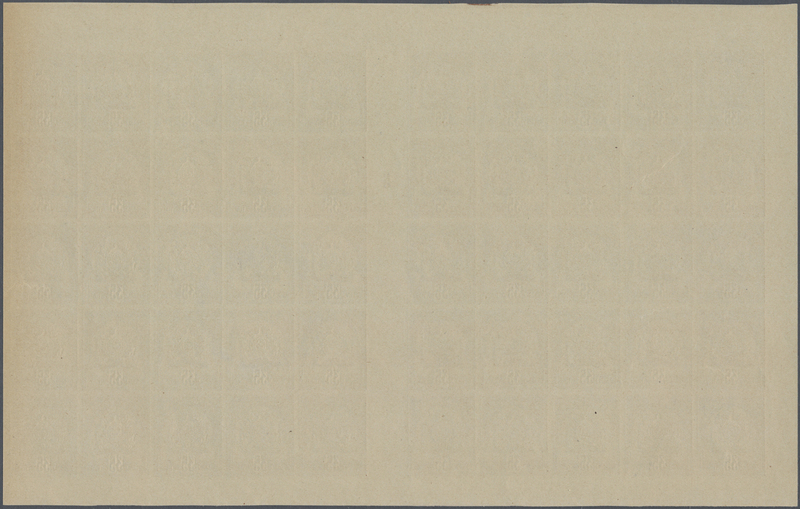 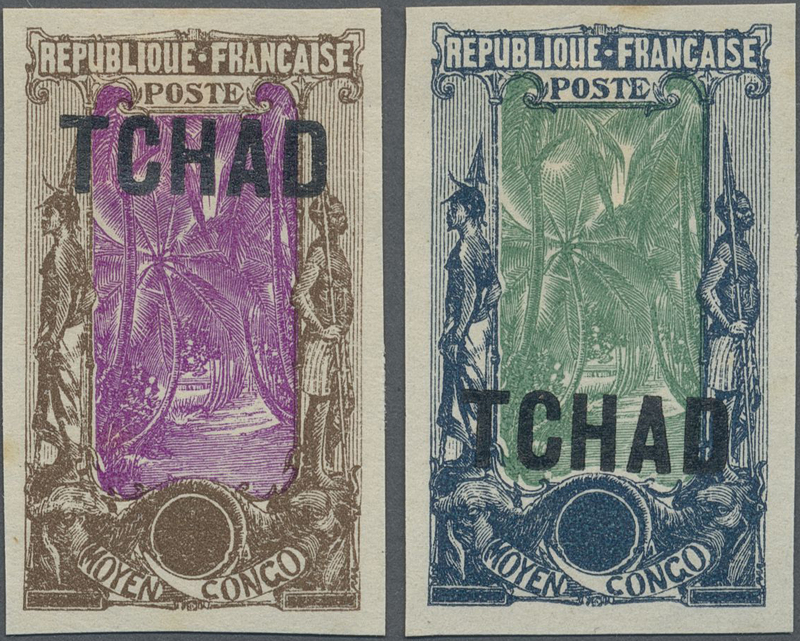 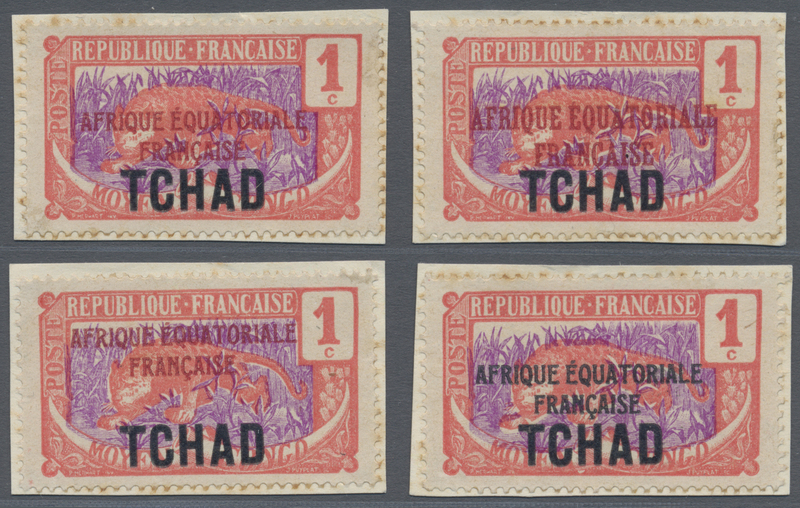 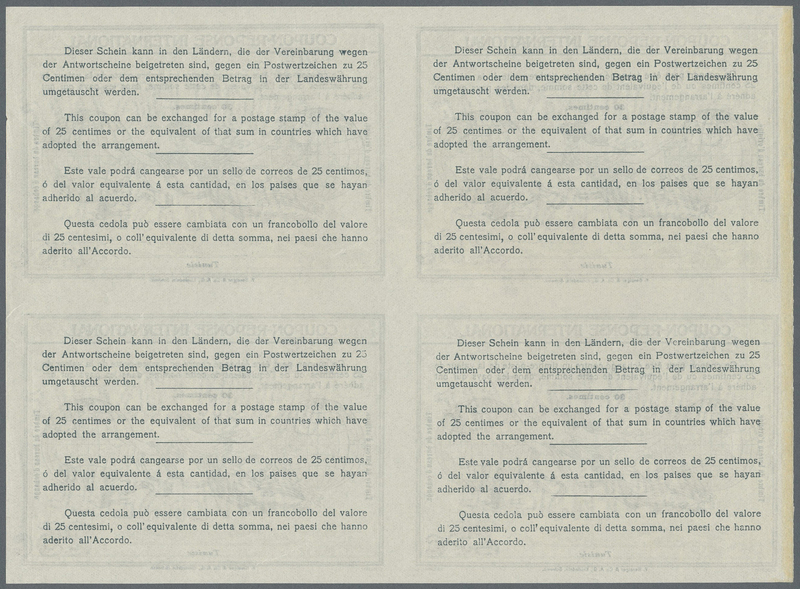 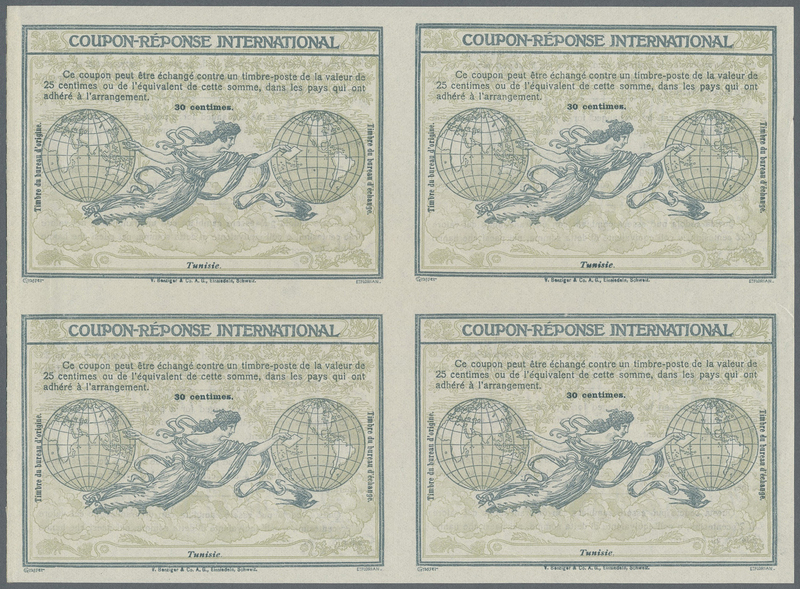 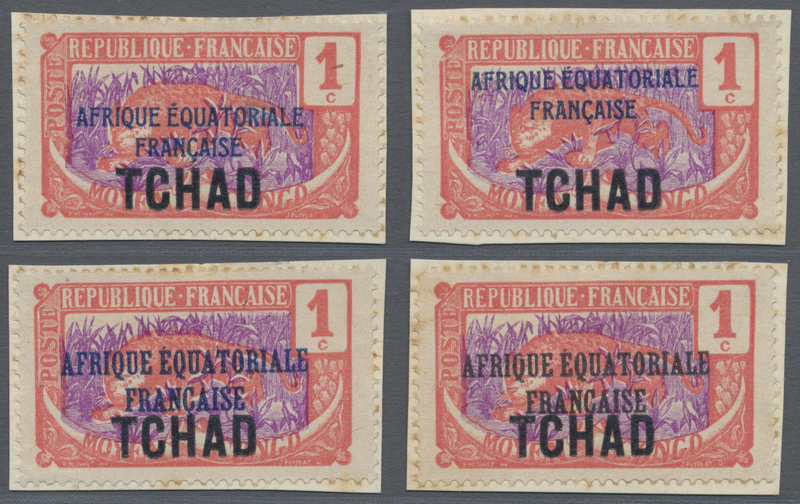 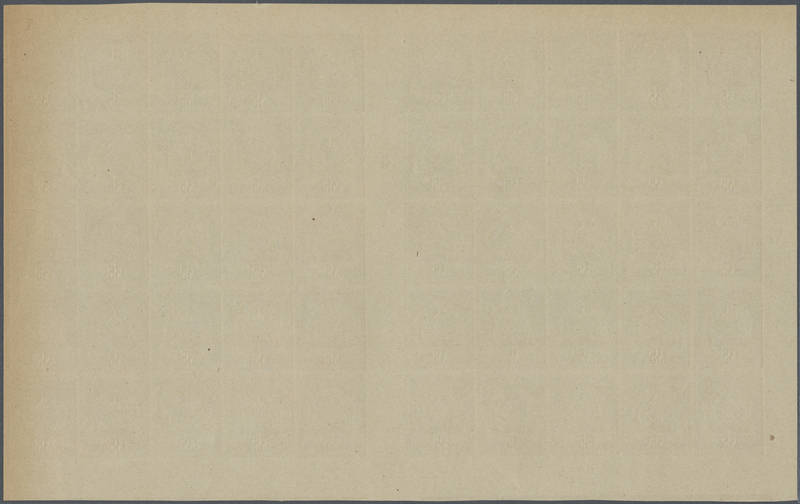 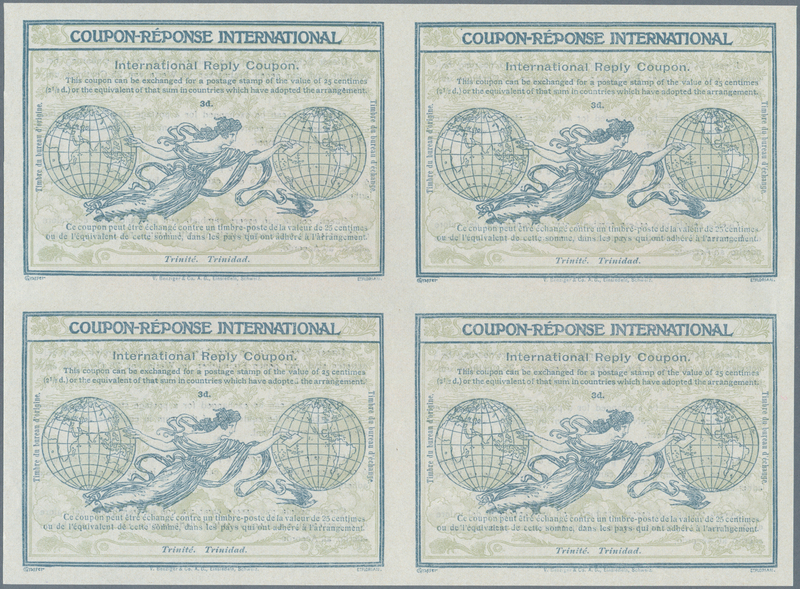 to 5fr., plain background, complete set of eight values, each as single die proof in issued design and colours on ungummed tinted paper. 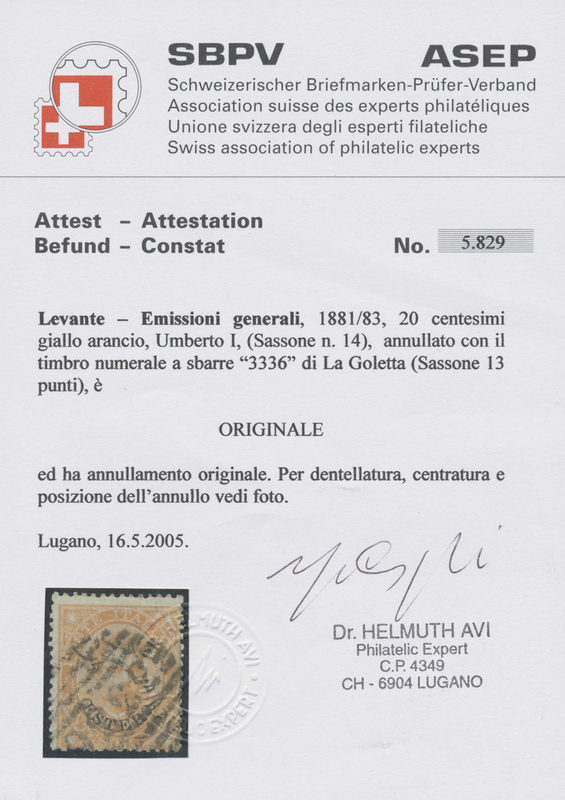 Maury refers to 1/8, tirage sur feuillet, papier teinture, 4.000,- € ++. 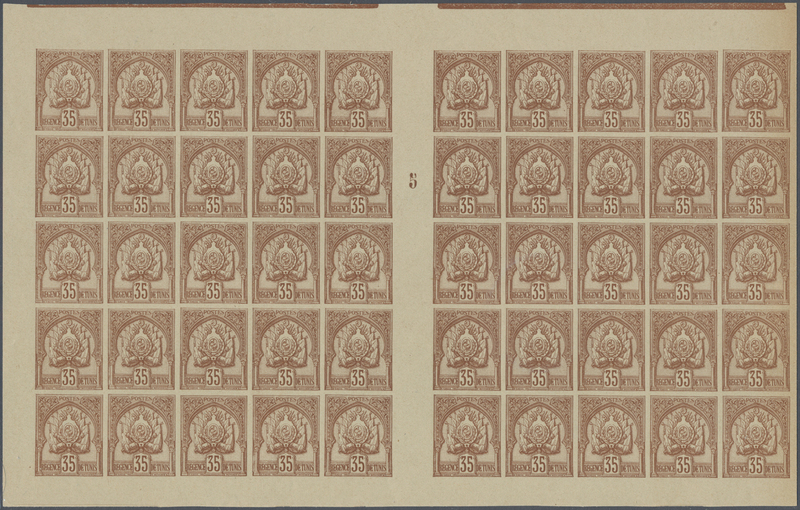 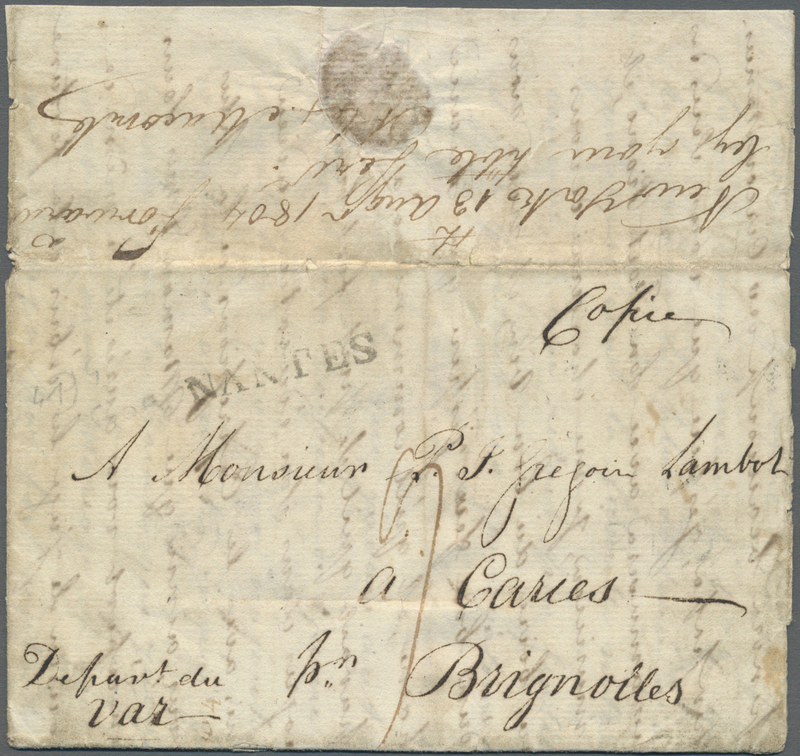 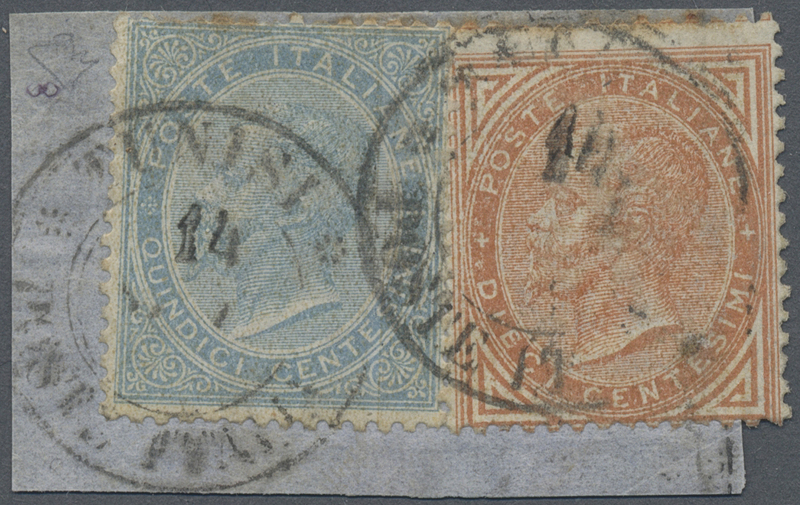 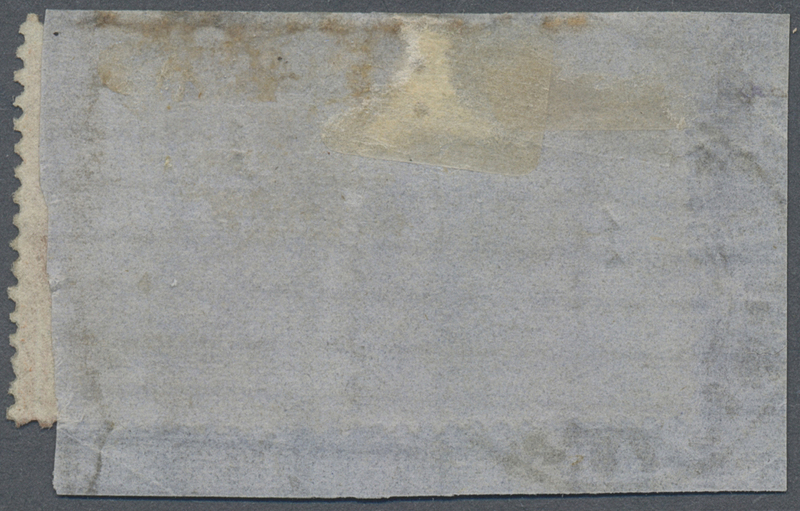 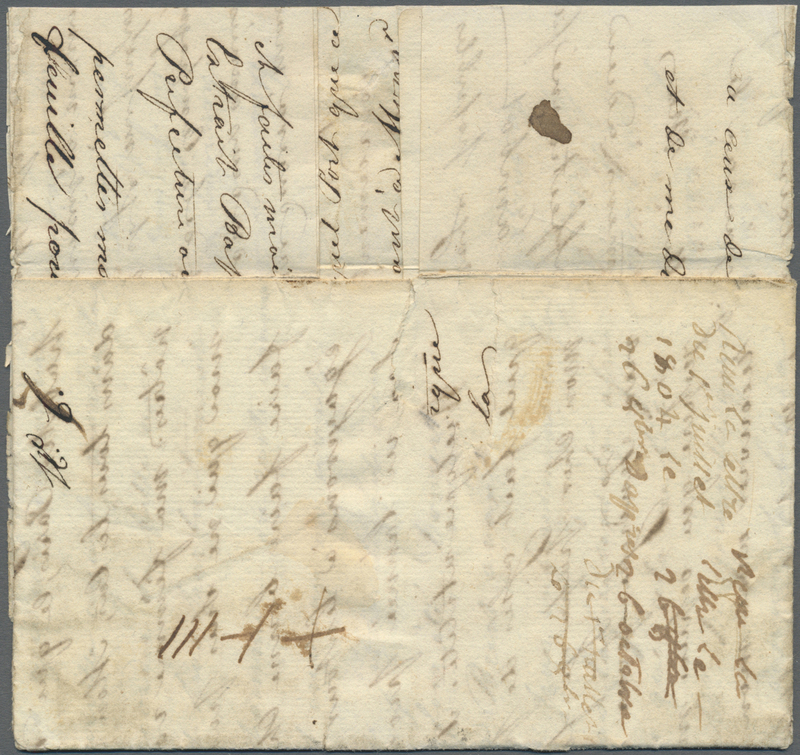 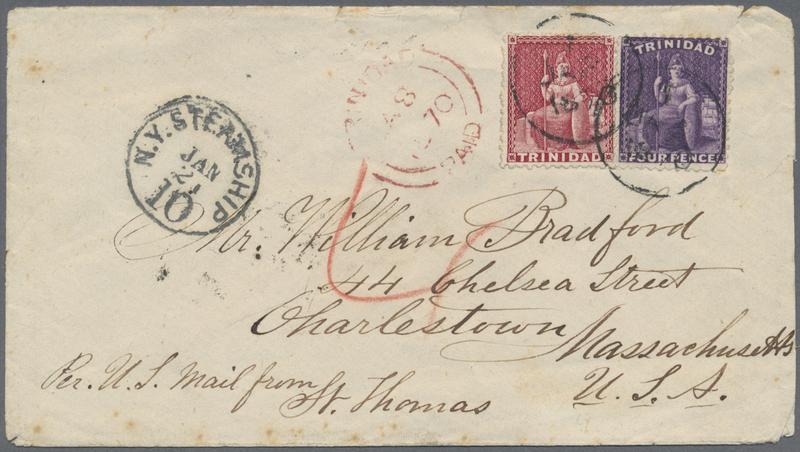 12903 Brief (cover) 1, 2 (12), 3 (5) 1888, 1c. 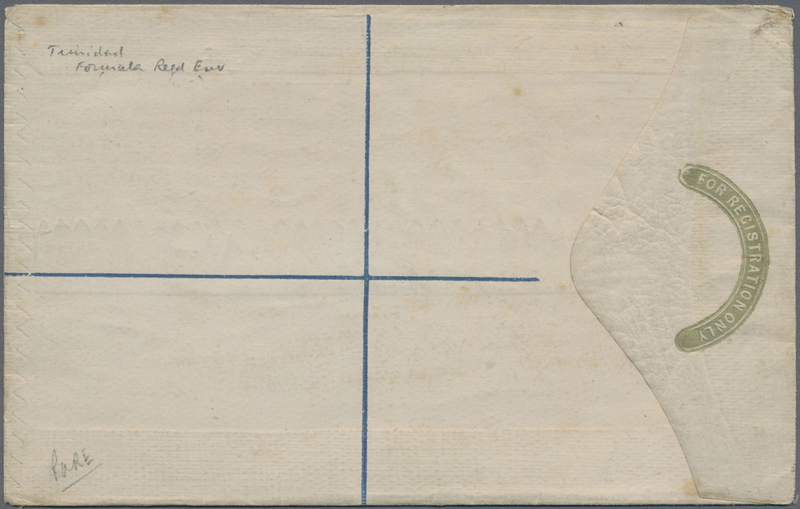 black on blue, 2c. 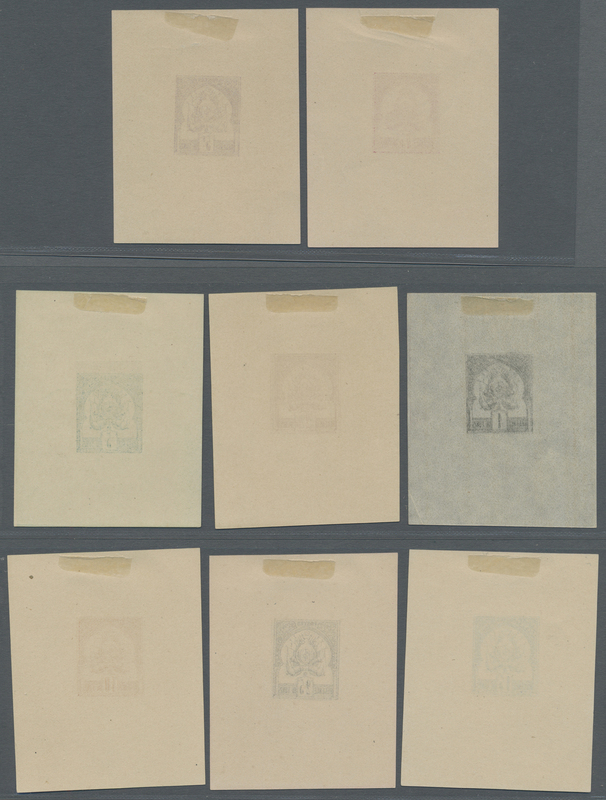 brown on cream (12) and 5c. 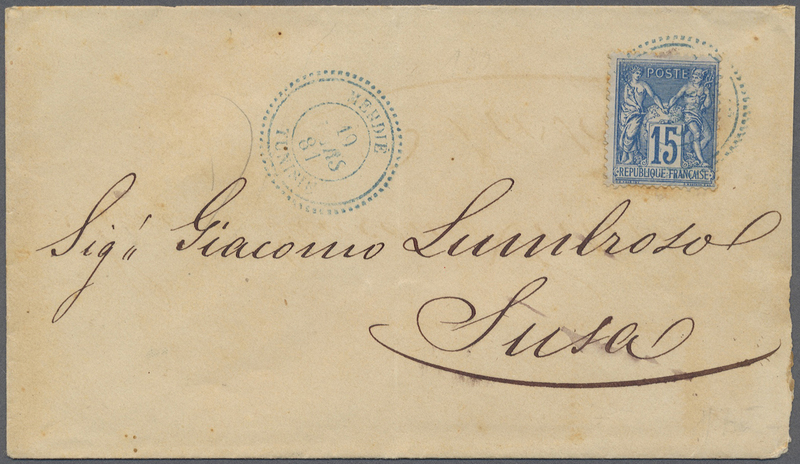 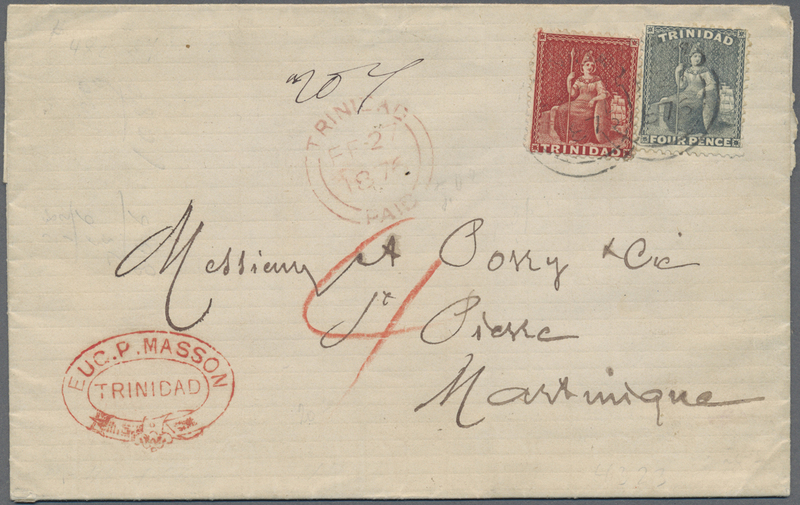 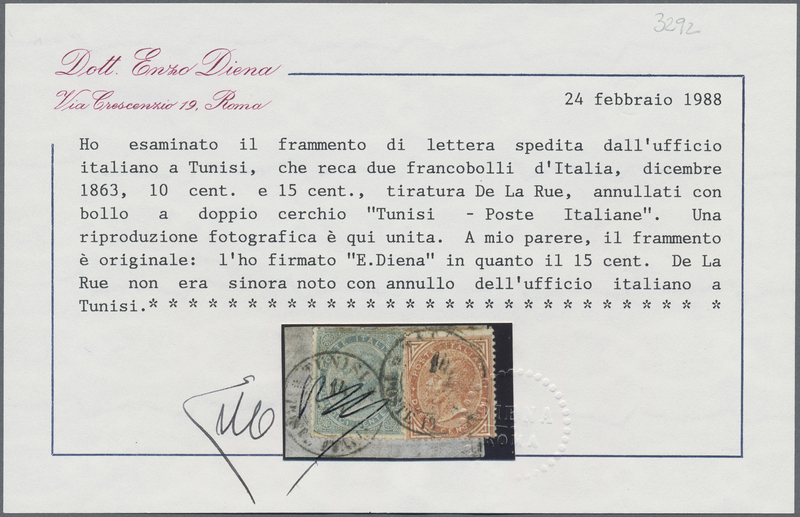 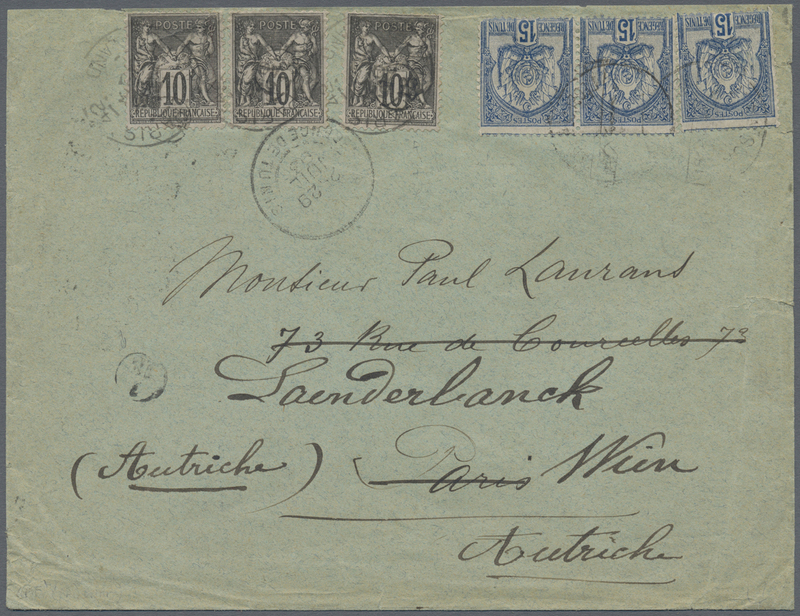 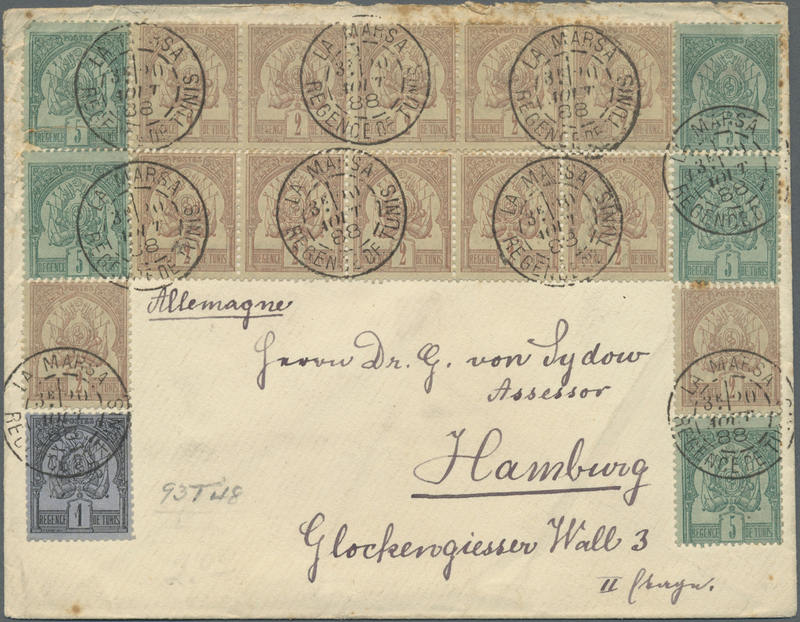 green on green, attractive 1st issue franking on cover from "LA MARSA 20 AOUT 88" to Hamburg/Germany with arrival mark 24.8. on reverse, stamps and cover some ageing marks/postal wear/imperfections but very rare and unusual franking - quite shortly after date of issue!